Slovenian architecture firm SoNo Arhitekti completed a gorgeous modern home that’s stunning in its use of contrast and texture. Created for a large family of seven, the 410-square-meter House XL draws influences from both urban and rural settings in Slovenia. 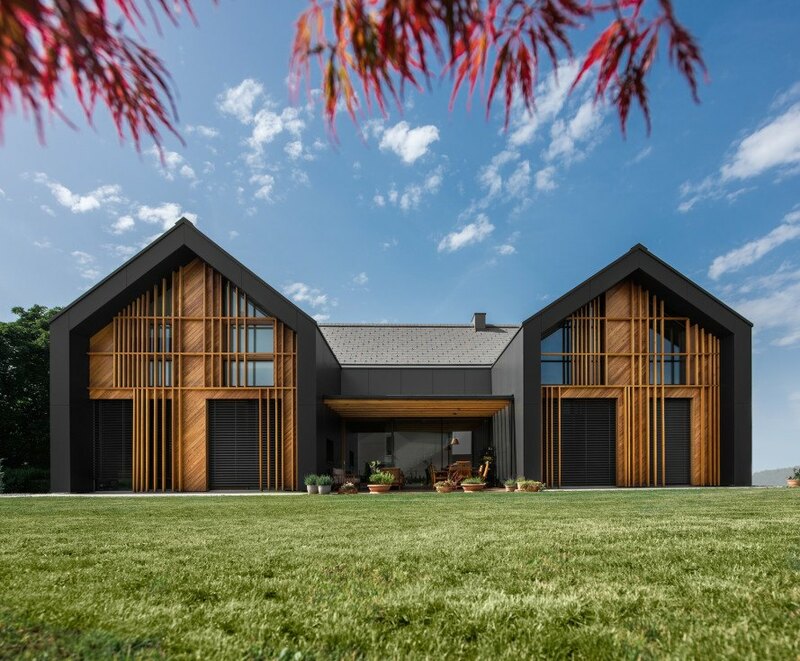 Its three symmetrical gabled roofs allude to the farmhouse vernacular, while its sleek black facade and sculptural timber cladding give the house a sophisticated urban vibe. Located on the outskirts of a new residential area, House XL comprises two gabled volumes that lie parallel to one another and are connected by a third gabled volume perpendicularly placed. All three volumes extrude past the slatted timber and glazed facades to provide shade from the sun. 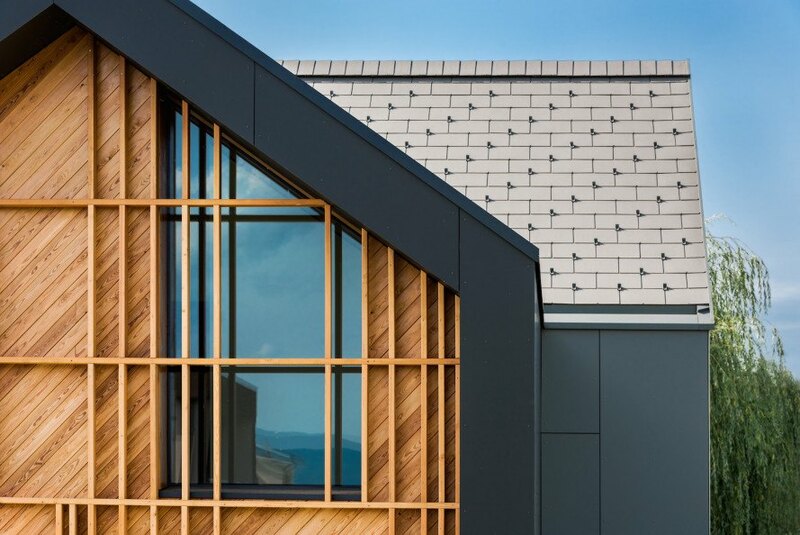 The two parallel volumes are clad in black panels while the third connecting volume is clad in light gray paneling; the colors and matte texture provide a striking contrast to the light-colored timber façade installed in diagonal and grid patterns. The interior features a light-filled and spacious floor plan split into three levels: a basement and two upper floors. The small basement level was constructed with reinforced steel, while the upper levels consist entirely of cross-laminated timber elements. Large glazed surfaces let in natural light filtered by timber slats. The communal spaces, including the dining room, kitchen, and living areas are placed on the first floor and connect with an outdoor patio flanked by the parallel gabled volumes. The bedrooms are located on the topmost floor. Located on the outskirts of a new residential area, House XL comprises two gabled volumes that lie parallel to one another and are connected by a third gabled volume perpendicularly placed. All three volumes extrude past the slatted timber and glazed facades to provide shade from the sun. The colors and matte texture provide a striking contrast to the light-colored timber façade installed in diagonal and grid patterns. colors and matte texture provide a striking contrast to the light-colored timber façade installed in diagonal and grid patterns. The small basement level was constructed with reinforced steel, while the upper levels consist entirely of cross-laminated timber elements. Large glazed surfaces let in natural light filtered by timber slats. The communal spaces, including the dining room, kitchen, and living areas are placed on the first floor and connect with an outdoor patio flanked by the parallel gabled volumes. The bedrooms are located on the topmost floor.